I have never been a big fan of automakers starting vehicle fan pages. There are exceptions to my thinking, for example halo cars like the Mustang or Corvette or when one vehicle is more compelling than your brand alone - like the Subaru WRX. My thinking is you are lucky to get a person to fan any of your fan pages, so why not drive people to your brand fan page where you can talk about the car/truck/suv they are interested in, but also market some of your other products and brand messages. It's a great opportunity to showcase your product portfolio. Acura has decided this is the way to go. 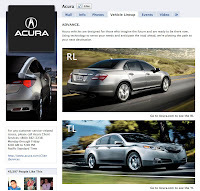 They started with a strategy of having the Acura brand fan page, but also have a tab called "Vehicle Lineup" where fans could click and go to each vehicle fan page. Now Acura fans click the vehicles in the tab and are taken to the Acura.com website vehicle page and isn't this all about driving consumers to your optimized shopping site? Okay, it's not all about that, but you should be working to get fans to your .com site. 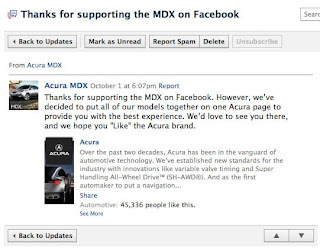 The other reason to not have unique vehicle fan pages, especially for brands like Acura that are more defined by the brand than one vehicle, is the extra resources to manage the vehicle pages and also you start segmenting your fans so your advertising becomes a discussion around whether to drive Acura fans or vehicle page fans. Why not simplify? 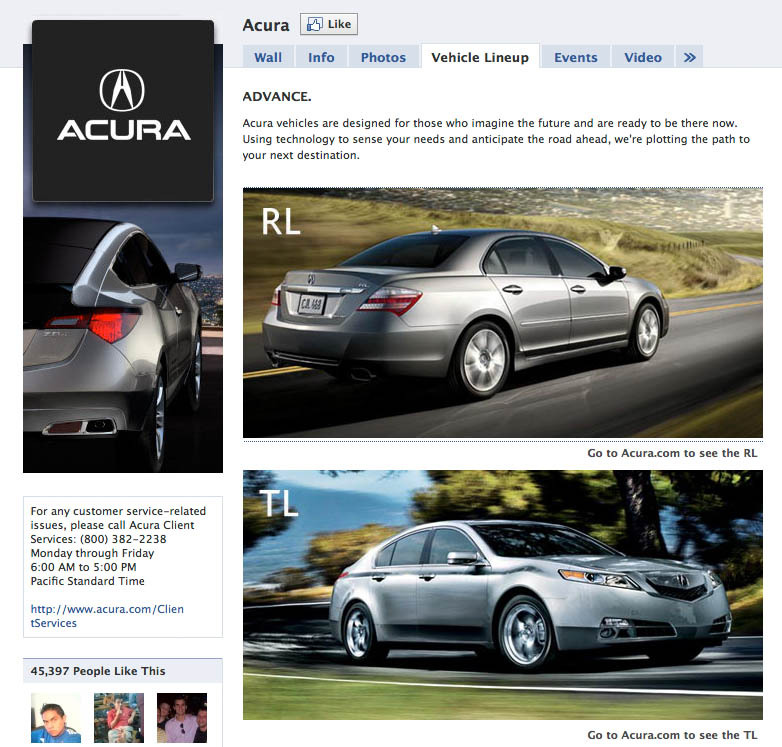 On an interesting note, Acura did not get the fans moved from the vehicle pages to the brand page. I'm guessing a lot of brands will not change their strategy because they cannot simply transfer fans from one product to a brand page. This is the old issue with sunken costs and how some tend to hold on to bad investments simply because they spent a bunch of money already. It will be interesting to see if other automakers (and other industries) will catch on and focus on building their brand, not individual product pages.